Supporting you in the professional organisation of your business, this Paper Towel Dispenser C V Fold is a sleek and practical addition. Designed to keep your paper towels in one compact location, it can be easily mounted flush to the wall and is suited to the smallest of WCs. The outer casing has been manufactured from ABS plastic and finished in a gloss brilliant white that is easy to wipe clean and sanitise. For versatility, the dispenser has been manufactured to distribute both C and V fold towels with a lockable construction that prevents theft and reduces the risk of cross-contamination. 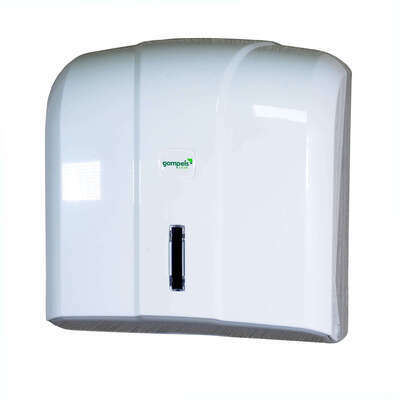 This paper towel dispenser is the perfect option for every environment from nurseries through to residential homes. ABS construction is hardwearing and smooth to support your infection control regime. This dispenser is compatible with both our C Fold Paper Hand in White and in Blue as well as our V Fold Paper Towels in White.